You remember the first time you thought about flushing your brother or sister (nephew in my case) down the toilet? You wondered: where they would end up? would it be a fun trip down ? And what a big splash it would make as you reached the end of the tunnel. Today I actually got to experience it (except without all the human waste). At the water park that we went to there was a water slide we nick-named “The Toilet Bowl.” You start at the top going through a tunnel slide then shoot out of a tunnel and into the toilet bowl. 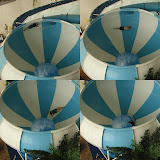 After spinning around the bowl a few times you would be flushed out into a swimming pool. (click on image to see larger view) It was a lot of fun – except for when I banged my elbow on the side because I wasn’t lying properly.